Charles Kent "Charlie" Wilson (born January 29, 1953), also known as Uncle Charlie, is an American R&B singer, songwriter, producer and the former lead vocalist for The Gap Band. As a solo artist he has been nominated for eleven Grammy awards and six NAACP Image Awards (including one win), received a 2009 Soul Train Icon Award, and was a recipient of a BMI Icon Award in 2005. In 2009, he was named Billboard magazine's No. 1 Adult R&B Artist, and his song "There Goes My Baby" was named the No. 1 Urban Adult Song for 2009 in Billboard Magazine. On June 30, 2013, BET honored Wilson with a Lifetime Achievement Award that was presented to him by Justin Timberlake. The BET tribute performances included renditions of Wilson's songs performed by India Arie ("There Goes My Baby"), Jamie Foxx ("Yearning for Your Love"), and Stevie Wonder ("Burn Rubber") but it was not until Wilson himself took to the stage at the request of Timberlake to perform his Grammy-nominated song "You Are" and then transition into a medley of hit songs performing alongside Timberlake and surprise guests Snoop Dogg and Pharrell Williams that Wilson stole the show during the youth-oriented program. The Charlie Wilson tribute helped BET achieve the highest ratings in years for the program and also earned the network the #1 primetime spot in the 18–49 demographic topping all its broadcast and cable competition for the night in both demographics and total viewers. Wilson is the national spokesman for the Prostate Cancer Foundation where there is a Creativity Award in his name which donates hundreds of thousands of dollars a year to researchers across the country for the development of creative science that conforms to PCF funding principles but is short-term and designed to allow development of otherwise unfunded ideas. Charlie Wilson was born in Tulsa, Oklahoma, on January 29, 1953; he was the son of the Reverend Oscar Wilson, a minister in the Church of God in Christ. With his older brother Ronnie and younger brother Robert, Wilson often sang in church before their father’s Sunday sermons, accompanied on piano by their mother. He also sang in his junior high school's choir, which was a precursor to his musical career with The Gap Band and later his solo career. He attended high school at Booker T. Washington. He attended Langston University and would go on to become drum major in the Langston University Marching Pride. From the start of his career, Charlie and his brothers, Robert and Ronnie, helped define and popularize an upbeat form of funk music that was infectious and lasting with their group The Gap Band. The group's songs such as “Outstanding”, "Party Train", "Yearning for Your Love", "Burn Rubber on Me", “You Dropped a Bomb on Me”, and “Oops Upside Your Head” are among their immense catalog and some of the most sampled songs in music history. After 15 albums The Gap Band announced their retirement in 2010. According to Wilson's website, rapper Snoop Dogg (with whom he is good friends) nicknamed him "Uncle Charlie". Snoop and his wife, Shante, renewed their vows in April 2008 at Wilson's 20 acre ranch outside of Los Angeles, CA. The event inspired the music video to Wilson's hit "There Goes My Baby", which featured Snoop and his wife and was given to them as a gift symbolizing their relationship. Paran and Wilson independently released Wilson’s first solo album Bridging the Gap, which scored them Wilson’s first No. 1 Billboard Urban Adult Contemporary single, “Without You.”. In 2004, Paran successfully negotiated a multi-album deal for Wilson with Jive Records. The first album from that deal, Charlie, Last Name Wilson, debuted in the fall of 2005 featuring production from various hit-making producers including R. Kelly, Justin Timberlake, will.i.am, the Underdogs, Kay Gee, and The Platinum Brothers. The album, which was certified gold by the R.I.A.A., produced the hit single, “Charlie, Last Name Wilson". Since then, Wilson has consistently topped the Billboard Urban Adult Contemporary chart with singles from his follow up albums through P Music/Jive Records. His 2009 CD, Uncle Charlie, debuted at No. 2 on the Billboard Hot 200 and No. 1 on the Billboard R&B/Hip-Hop chart, and received two 2010 Grammy nominations: Best R&B Album and Best R&B Vocal Performance, Male for "There Goes My Baby". In December 2010, Just Charlie, was released and spawned the hit single “You Are" which held the No. 1 spot on the Billboard Urban Adult Contemporary chart for 13 weeks as well as 15 weeks consecutively on the Mediabase chart. The song earned two 2012 Grammy nominations, Best R&B Performance and Best R&B Song, giving Wilson, his wife Mahin, and their fellow songwriters Dennis Bettis, Carl M. Days, Jr., and Wirlie Morris (who co-produced the track with Wilson) their first nomination as songwriters together. In 1989, Wilson worked with Eurythmics on their album We Too Are One, providing backing vocals on several tracks and co-writing the hit song "Revival". Wilson performed the song with the band on the British television chat show Wogan in August 1989. Wilson has also been a vocalist and contributor/collaborator to dozens of songs in the hip hop, rap, and R&B communities. Wilson appeared on The Biggie Duets together with R. Kelly on the song "Mi Casa". He has worked with Snoop Dogg on numerous projects. Their first collaboration was Snoop's 1996 album Tha Doggfather, on which Wilson appeared on four songs: "Doggfather", "Snoop Bounce", "Groupie" (also featuring 213, and "Tha Dogg Pound"), and "Snoop's Upside Ya Head". Wilson also worked with 2Pac and The Dogg Pound on an unreleased song "Just Watching" (1996), as well as "Wanted Dead Or Alive", which featured him on the hook and 2Pac & Snoop rapping. He was also featured on the Grammy-nominated single "Beautiful" (together with Pharrell) from Snoop's 2002 album Paid tha Cost to Be da Boss. Additionally, Wilson appeared on "Signs" (with Justin Timberlake) and "Perfect", both songs from Snoop's 2004 album R&G (Rhythm & Gangsta) The Masterpiece. He was also featured on Snoop's 2008 album Ego Trippin', on the songs "SD is Out" and "Can't Say Goodbye"; the latter was also performed live with Snoop and Wilson at 2008's American Idol Gives Back charity concert. In 1998, Wilson performed on Mystikal's Ghetto Fabulous album. In 2007, Wilson performed in two songs on UGK's Underground Kingz album: "Quit Hatin' the South" and "How Long Can It Last". In 2010, chart-topping producer/artist, Kanye West included Wilson on his CD, My Beautiful Dark Twisted Fantasy. Wilson recorded over a dozen songs with Kanye and appeared on the following songs: "See Me Now", with Kanye West featuring Beyoncé; "All of the Lights", with Kanye West featuring Rihanna; "Lost in the World", "Runaway", and "Monster", with Kanye West featuring Jay-Z, Nicki Minaj, and Rick Ross. In addition to these songs, Wilson appeared on five of the G.O.O.D. Friday Releases to promote the new CD including, "Lord, Lord, Lord" with Kanye West, featuring Mos Def, Swizz Beatz, Raekwon; and "Good Friday" with Common, Pusha T, Kid Cudi, and Big Sean. He also appears on "Bound 2", the closer of Yeezus, West's 2013 album. Altogether Charlie Wilson's albums have sold over one million copies. In 2008, Wilson participated and performed on the ABC Television Special, America United: Supporting Our Troops, which was taped at Camp Pendleton, in California. Wilson has made it his personal mission to support American troops, especially in the Middle East. He and his band have traveled to Kuwait and Iraq four times (2009, 2010, and twice in 2011), taking his critically acclaimed, high energy show to dozens of bases throughout both countries and giving American military members a “little taste of home." Wilson's November 2011 trip was in response to a special request by the U.S. Armed Forces for Wilson to return to the Middle East and perform at five bases in Kuwait for the thousands of troops stationed there. In 1995, Wilson married Mahin Tat. They met on that same year, when she was his social worker during his time in a drug rehabilitation program. Since 1995, Wilson has been clean from cocaine and his alcohol addictions that led him into becoming homeless and beginning sleeping on the streets of Hollywood Boulevard, which happened from 1993 to 1995. In 2008, he was diagnosed with prostate cancer and treated successfully with implants. He has since worked with the Prostate Cancer Foundation, encouraging black men to be tested for the disease. He has also spread awareness by providing vocals for Lupe Fiasco's single, titled "Mission", which focuses on cancer survivors. Wilson has been nominated for eleven Grammy Awards. 2016 Grammy Nomination – Best Traditional R&B Performance for "My Favorite Part of You"
2015 Grammy Nomination – Best Rap Song (with Kanye West) for "Bound 2"
2015 Grammy Nomination – Best Rap/Sung Collaboration (with Kanye West) for "Bound 2"
2014 Grammy Nomination – Best Gospel Song for "If I Believe"
2012 Grammy Nomination – Best R&B Performance "You Are"
2012 Grammy Nomination – Best R&B Song for "You Are"
2010 Grammy Nomination – Best Male R&B Vocal Performance for "There Goes My Baby"
2003 Grammy Nomination – Best Rap/Song Collaboration (with Pharrell & Snoop Dogg) for "Beautiful"
1997 Grammy Nomination – Best R&B Performance by a Duo or Group with Vocals (with Luke, Mr. X, Melle Mel, Yo-Yo, Chaka Khan, Da Luniz, Shaquille O'Neal, Quincy Jones & Coolio) for "Stomp"
2016 NAACP Image Award Nomination – Outstanding Song Traditional for "Goodnight Kisses"
May 14, 2010 – The City Council of the City of Pittsburgh declared May 14 “Charlie Wilson Day” for his continued commitment to educating men about the importance of yearly checkups and early screening for prostate cancer. 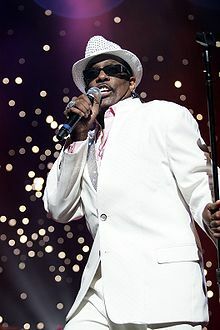 April 1, 2010 – The Cook County Board of Commissioners in Cook County, IL and Mayor Richard Daly declared April 1 "Charlie Wilson Day." November 27, 2009 – City of Buffalo, Executive Chamber Proclamation names November 27, "Charlie Wilson Day"
July 16, 2009 – Indiana Black Expo presented the Rev. Charles R. Williams Excellence Award to Charlie Wilson for his commitment to educating the African American Community about Prostate Cancer. April 6, 2009 – The Prostate Cancer Foundation created The Charlie Wilson Creativity Award which was presented to Adam Dicker, MD, PhD, Karen Knudsen, PhD – Thomas Jefferson University for their work on “Self-Seeding and Radiation Therapy: A New Strategy Against Metastatic Prostate Cancer – Preventing Circulating Prostate Cancer Cells from ‘Re-seeding’ in the Prostate May Change Behavior of Metastatic Cells. June 18, 2001 – Oklahoma Jazz Hall of Fame presented to The Gap Band the Award for the Arts & Humanities “In Honor Of Your 25th Year in the Entertainment and Music Industry. Charlie Wilson's vocal style and performance continue to influence some of today’s most popular artists, including Snoop Dogg, R. Kelly, Justin Timberlake, and Kanye West. ^ a b "Charlie Wilson – There Goes My Baby". YouTube. 2009-11-24. Retrieved 2012-04-04. ^ "Charlie Wilson Scoops the Youth-Oriented BET Awards". SPIN. 2013-07-01. Retrieved 2014-08-10. ^ Rick Kissell @ratesrick (2013-07-02). "BET Awards Ratings Hit 4-Year High, Rules As Sunday's Most-Watched Show". Variety. Retrieved 2014-08-10. ^ The Wikipedia Files with Charlie Wilson (Gap Band, not late congressman). Archived June 18, 2010, at the Wayback Machine. Wikipedia Files. 6 April 2010. ^ "Without You – Charlie Wilson". YouTube. Retrieved 2012-04-04. ^ "Charlie Wilson – You Are". YouTube. 2010-12-09. Retrieved 2012-04-04. ^ "Charlie Wilson performs for the United States Troops in Kuwait and Iraq February 2011". YouTube. 2011-04-16. Retrieved 2012-04-04. ^ Associated Press. "Former Gap Band singer Charlie Wilson goes from homeless to Grammy nods". cleveland.com. Retrieved 2012-04-04. ^ "See the Winners! 2013 SoulTracks Readers' Choice Awards | SoulTracks – Soul Music Biographies, News and Reviews". SoulTracks. Retrieved 2014-08-10. ^ "Trumpet Awards 2013 Honorees Announced: Rickey Smiley and Essence Atkins Will Co-Host Star-Studded Ceremony". Trumpetfoundation.org. Retrieved 2014-08-10.